It is well-known fact in spiritual circles that one cannot by himself comprehend the genuine Vedantic teachings by a study of ‘Prasthaana Traya Bhaashyas’ of Adi Shankara without the help and guidance of a preceptror well-versed in the traditional methodology of utilizing the ‘Adhyaaroapa Apavaada Nyaaya’ which is implicit in and through those Bhaashyas. 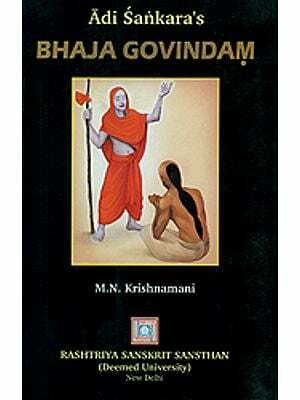 Even the avowed followers of Adi Shankara, scholars, academicians and anchorites have miserable failed to bring about a convincing reconciliation among all the teachings or doctrines of the triad of the original Bhaashyas as well as between the spiritual teachings pertaining to ‘Dharma Jijnaasa’ and ‘Brahma Jijnaasa’. Consquently, their interpretations and commentaries – verbal or written –bristle with contradictions and inconsistencies. Besides, the traditional or Saampradaayic methodology handed down from the teacher (Adi Shankara), who even to this day shines like a brilliant sun on the Vedantic firmament, have been virtually lost sight of or denied to the true seekers of the Ultimate Reality of Brhman or Atman. The modern educated intellectuals with their professed ‘scientific temperament’ take every opportunity and use every forum to decry and denigrate the time-honoured and time-tested Vedantic philosophy and question its very relevance in this Nuclear Age of scientific progress. Suffice it to say that ‘Reality’ has pr force to be universal and invariable in all climes, times and ages. This hard fact cannot be denied by any empirical scientists worth his salt. If the Vedantic ‘Absolute Reality’ of Atman is beyond all empirical transactions and phenomena and, at the same time, if the ‘Science of Vedanta’ brings home this Ultimate Reality as one’s own essential Being of Atman using an immaculate and infallible methodology of teaching, then it becomes evident to any ardent seeker of this all-comprehensive and all-pervasive Reality that this ‘Atman Vidya’ is in truth the ‘summum bonum’ of all human endeavour and prosperity. It deserves to be given the ride of place in all educational institutions and academies. There are innumerable books published in the name of Shri Adi Shankara but to an unbiased, discerning mind it becomes quite clear that they present and propound tenets which are fundamentally contradictory to one another, as also dogmatic or doctrinaire in content. It also becomes evident that even those eminent scholars, who profess and parade quite ostentatiously their erudition swearing by and in the name of Adi Shankara, are illtriguingly populatsing various but mutually contradictory methodologies and interpretations inter se. With the result, those inveterate opponents and critics of Shri Shankara, who are ever ready to pick holes in his Advaita (Non- dualistic) philosophy, are having a field day and an ample scope for critizing and controverting the great Achaarya’s teachings. It being so, the genuine seekers of the Ultimate Reality (viz. Mumukshus) get, more often than not, confused and confounded, unable to reckon as to what is the genuine methodology of teaching of Shri Adi Shankara. Il is accepted universally that the genuine works of Adi Shankara are his famous Prasthaana Traya Bhaashyas which are his original commentaries on the triad of authoritative canonical sources, viz. 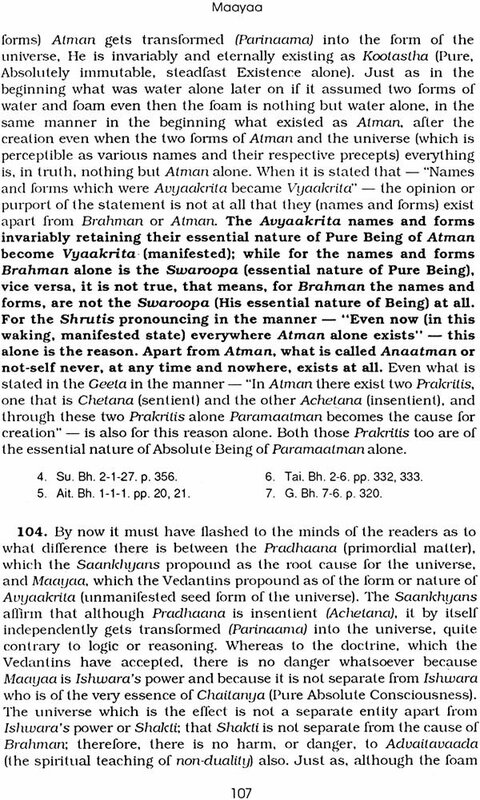 the ten principal Upanishads, the Bhagavadgeeta and the Vedanta Sootras (popularly going by the name of Brahma Sootras), and these being extant in their original texts or forms with hardly any variations, there is no scope or possibility for anyone to challenge their authenticity or authorship. But it will be a Herculean task, if at all, for the common people – why, even for many scholars - to study all these original Bhaashyas meticulously, sin and codify the great savant's genuine spiritual teachings of philosophy by themselves. 1 knee, this stupendous task has been attempted in this treatise with a good deal of success. The first and foremost, as also an exclusive, feature of this treatise is to dissect and diligently analyse all those difficulties and anomalies which may apparently be met with by a seeker as he endeavours on his own to collate and confirm the teachings of the Bhaashyas, and to point out all those important aspects of those tenets to be remembered. 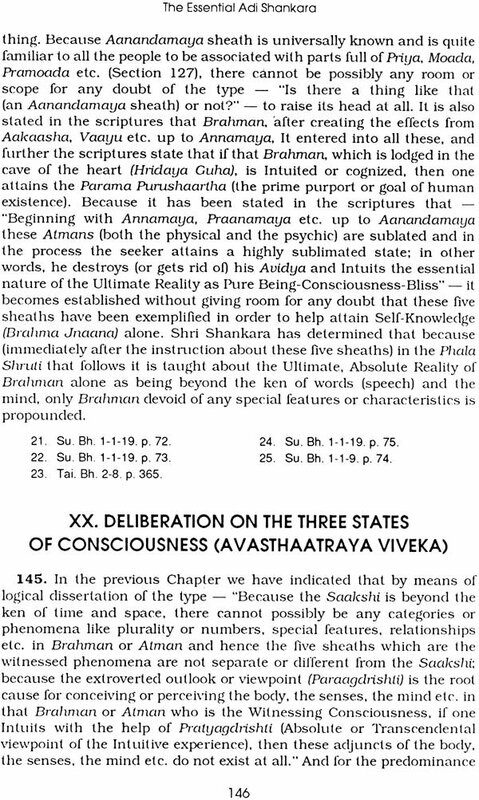 The second, but equally valuable, feature of this book is an extraordinary attempt being made herein to codify Adi Shankara's teachings under 26 different topics or heads of burning interest to a true Vedantin and to give a big list of quotations or excerpts from these Prasthaana Traya Bhaashyas so as to substantiate and justify the codified conclusions so drawn under each topic in all its wide range of aspects or perspectives. Perhaps, such an arduous attempt made with regard to so many topics - especially those which have given rise to a great number of controversies - being enumerated and elaborated upon in one single book is the first of its kind, or at least unparalleled. Thus it will not be an exaggeration or a false claim if it is said that this treatise will provide a much-needed opportunity for seekers and scholars alike to ratiocinate and ruminate over a good many thought-provoking topics and tenets. After having stated briefly the subject-matter of this treatise, its need in these present times and its special features, it would be in the fitness of things to remind ourselves about the time, the place of his birth and such other related aspects of history of this world-renowned philosopher-saint. But it is unfortunate that barring the fact of his place of birth to be Kaaladi in Kerala the other details of his life history have become topics of raging controversies, and this confusion is caused despite there being nearly 10 to 12 so-called "Shankara Vijayas", which are eulogies pertaining to the Achaarya’s achievements and deeds and which contain mutually conflicting accounts or statements. None of these "Shankara Vijayas" is written by a contemporary of the Achaarya; besides, all of them differ on the main points and features from one another. 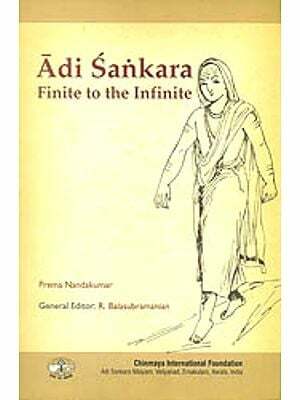 Whether it was because his contemporaries did neither envisage nor cultivate a historical perspective or whether it was because the writers of his time attached all importance to his spiritual teachings alone (and perhaps thought that if his doctrines are discussed and disserted, it would amount to the best way of remembering and adoring him), except for the Vedantic texts that Adi Shankara authored and the post-Shankara commentaries and sub-commentaries on them we do not have any other clues to confirm the facts of his historical background. Hence we have to content ourselves with whatever spiritual teachings Adi Shankara has bequeathed to and bestowed upon us through his works, especially his Prasthaana Traya Bhaashyas, and try sincerely to adapt and integrate, to whatever extent possible, our present way of life, and style of life to boot, in keeping with the innate and implicit ethos of his teachings so as to be worthy of being his followers or admirers. There exists a deep-seated misconception in certain quarters that Shri Adi Shankara was the founder of Advaita Vedanta (Non-dualism). 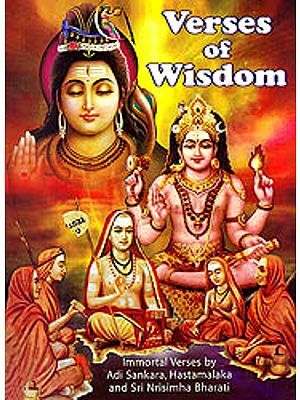 There is no dearth, however, of evidence to prove that he belonged to a line of traditional teachers (Sampradaaya) of spiritual wisdom like Shri Gaudapaada. Shri Dravidaachaarya, Shri Brahmaanandi etc. Shri Shankara has quoted a verse in the Taittireeya Bhaashya which runs as: "Yarime Gurubhihi Poorvam Padavaakyapramaanataha, Vyaakhyaataaha Sarvavedaantaastaastaannityam Prantoasmyaham.” This is a clincher. In the same manner, there are statements in his Brihadaaranyaka and Brahma Sootra Bhaashyas referring to them as "spiritual teachers who knew and belonged to the Vedanta Sampradaaya" From this it will be evident that by the phrase - "Shankara's spiritual teachings" - it does not mean that they are his own instructions conceived or founded originally by him. It also implies that among the teachings of his predecessors belonging to this traditional of preceptors these instructions found in Adi Shankara's original Bhaashyas must necessarily exist at least in an implicit seed form, but which were later on made explicit by him to suit the needs and circumstances of his times. Thus, in a secondary sense if we say that these are 'Shankara's teachings' it will not be improper. 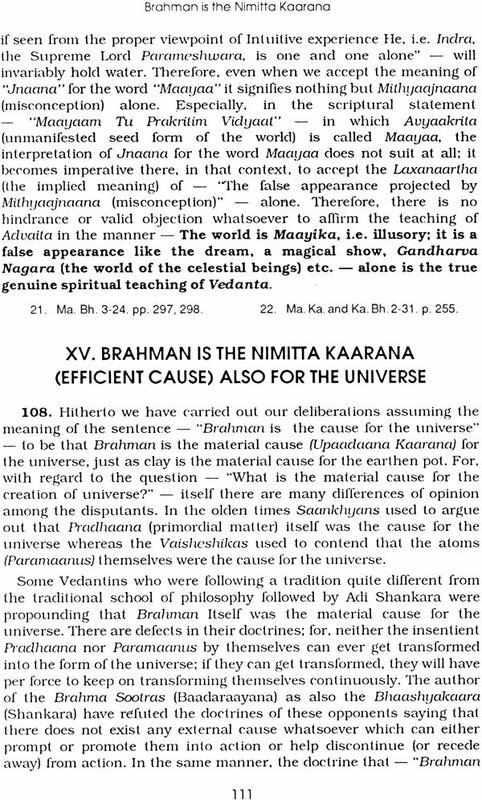 However, one salient feature about these matters we cannot afford to forget or neglect, and that is: Barring the Kaarikas of Shri Gaudapaadaachaarya, no other explanatory commentaries belonging to this particular Sampradaaya of Advaita Vedanta or sub-commentaries thereof are available now at all. Not only that, but also even the dissentions or criticisms by Vedantins belonging to an opposite camp are not available in their original forms whatsoever. Under the circumstances, it is tantamount to saying that all the genuine traditional Vedantic teachings up to the times of Adi Shankara have necessarily to be treated as coming down to us exclusively through his Bhaashyas alone. How far these spiritual precepts are true and relevant, especially in these modern times of civilization and unimaginable scientific advance, will have to be found out only after the aspirants test their veracity by adopting correctly the methodology that is enunciated and expounded in a highly profound, rational or scientific manner by these traditional teachers. One important fact, however, should never be lost sight of in this regard, and that is: Because the Ultimate, Absolute Reality (Brahman, Atman) that these teachers unanimously and unequivocally propounded is beyond the time-space-causation categories (why say more, beyond all empirical dealings), there is no scope or possibility whatsoever at any period of time, anywhere in any clime for anyone to refute or controvert these truths (as they are immutable and Intuitive). In support of this affirmation Shri Gaudapaada's Kaarika can be quoted: "Asparshayoagoa Vai Naama Sarvasattwasukhoa Hitaha, Avivaadoa Aviruddhascha Deshitastam Namaamyaham." We who live in the world of 'Contemporary Thought' can hardly afford to discard its parallelisms with the tendencies and theories of the thinking world of today. But any true students of philosophy who will take the trouble and pains to discern the common methodology and unity of purpose running in and through all the arguments and assertions in the present treatise will notice how very thought- provoking it would be for those who are genuinely interested in the tendencies, theories (nay, vagaries) of Contemporary philosophy. No wonder then that there are proponents who affirm that the Upanishadic philosophy propounds apparently doctrines of Absolute Monism, of Personalistic Idealism, of Pantheism, of Dualism, of Solipsism, of Self- Realization, of the difference between Intellectual and Intuitive dealings, and so on, and all these doctrines have divided the philosophic world of today indeed. Suffice it to say that this treatise will surely bring to the notice of such irresponsible and chronically prejudiced critics - whether Western or Indian - 'the variety and wealth of Upanishadic ideas on every conceivable subject in the domain of philosophy', and then in that event this book would have fulfilled its reason d’etre. In conclusion, if at all the present treatise points to any moral, 'it is the moral of the life of beatific vision' enjoyed at nil times by the Jnaani, the Realized soul. Now, a few points to be noted by the reader while going through this text. This being a free transliteration of the original Kannada book, entitled - "Suankara Vedanta Sara" by Shri Satchidariandendra Saraswati Swamiji, of Holenarsipur, of revered memory, it may contain many sentences which are long and involved desiderating some elucidation here and there: such explanatory remarks or notes have been given within brackets if only to facilitate the correct interpretation or understanding by the reader. Secondly, this treatise deals with a highly subtle, esoteric and profound subject needing an utmost degree of concentration of the mind on the part of the reader (who should be sincere and devoted, one expects, and not casual in his approach to the subject) and hence there may be many repetitions of sentences, phrases or technical Sanskrit terms 'with slight variations in their connotations to suit the context in which they are used. But they are relentlessly repeated invariably with <1 view to helping the seeker (especially one who is too raw or immature for Vedcl11lic dialectic) to cognize the real and correct import or purport only. For this reason alone, this (defect of) repetition may be condoned and construed to be rather an aid (nay. a virtue). The English translations of the original Sanskrit excerpts of Shri Shankaraachaarya's extant Bhaashyas (original) are selected from the books by reputed authors, mainly from the Ramakrishna Mission Order, and are given in the relevant Chapters and sections. The Chapters deal with many topics of Vedantic philosophy, and since several of them have given rise to controversies prevalent and kept alive in some circles, a diligent attempt has been made by the author to thrash out the discrepancies and the discordant notes to be found in the various interpretations (in vogue) in many present-clay Vedcl11lic texts by taking recourse to Adi Shankara's clarifications in his own original Bhaashyas. As a result, many a familiar and popular notion or conception held by even seasoned Vcc1antins may be rendered to be misconceptions, may misrepresentations or misinterpretations of the original text. However, in such an event the reader should not have or harbour any bias, rancour or malice at heart and with an open mind (full of catholicity) should try to reckon the truth to his own benefit. An attempt has been made to arrange the topics in a thematic sequential order to facilitate better understanding and appreciation of the genuine Vedantic teachings of Adi Shankara, to whose adoration and memory this volume has been dedicated by me. Equally I dedicate it to the memory of my spiritual guide and Guru but for whose grace I would not have undertaken such an arduous and ticklish task. I am beholden to the Publishers. Adhyatma Prakasha Karyalaya, Bangalore Branch. Thyagarajanagar, Bangalore - 560028. for giving me this opportunity to serve this great institution which is propagating pristine pure Advaita Vedanta of Adi Shankara for over two decades in the city. I am particularly grateful to Shri K. G. Subraya Sharma. M. A., the Karyalaya's enterprising and energetic Secretary, for his unstinted cooperation and encouragement in my work. I am greatly indebted to the Printers. Verba Network Services, Malleswaram, Bangalore – 560003, who have left no stone unturned in bringing out this attractive edition. Last but not the least, I am grateful to all those others who have given me moral support and to the readers. 1. 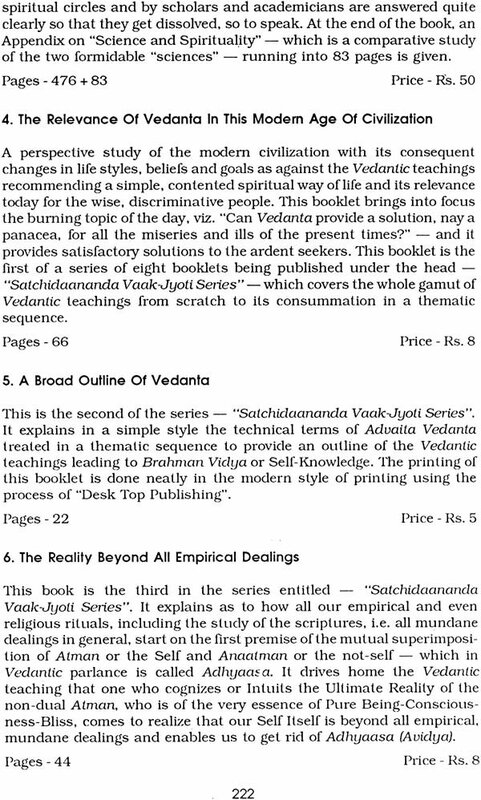 It is proposed to present in this treatise the essentials of Vedanta (i.e, the Indian or Hindu philosophical science) which are acceptable to (or authenticated by) Shri Adi Shankara. In the Indian continent many Vedantins prior to and after that great saint have composed treatises on Vedanta. But even to this day the special and inimitable features of that great teacher's spiritual teachings have remained exclusively unique and unparalleled. His spiritual teachings of Advaita Vedanta philosophy are relevant alive and vibrant; are even to this day providing thought-provoking concepts to the discerning seekers with regard to their well-being and all-round progress here in this life and hereafter. Shri Shankaraachaarya, like the other ancient preceptors, has written his treatises acknowledging fully the validity and authority of the Vedas. His writings are, in fact, of the form or nature of commentaries on the Upanishads. But, he has stressed the fact that Vedanta philosophy (as depicted or taught in the Upanishads) has expounded the Reality which can be Intuitively experienced (or to be short. Intuited) here and now (while living in this body). Shri Shankaraachaarya's extraordinary and exclusive opinion and teaching is: "That the Ultimate or Absolute Reality alone, which is in consonance with Saarvatrika Poorna Anubhava (universally acknowledged reason or dialectic and Intuitive experience) is taught or expounded in Vedanta philosophy". He has promised and pledged his word of honour that by virtue of Self-Knowledge or Jnaana vouched by the Vedanta philosophical science all the vicissitudes and ills of Man's transmigratory existence or Samsaara will be completely rooted out; hence, everyone (irrespective of his or her religious faith, ideology. nationality or culture) may make a sincere and dedicated attempt to attain this Self-Knowledge. Besides, this eminent preceptor has the spiritual support of a prominent lineage of traditional teachers like Shri Gaudapaada, Shri Dravtdaachaarya, Shri Brahmaanandi etc. ; but Shri Shankara has nowhere in all his commentaries or treatises said that one should believe in any textual or literary meanings or interpretations on the mere strength or support of traditional tenets or concepts. On the other hand, he opines that - "If any school of philosophy, whatever or whichever it may be. is defective and opposed or contrary to one's Intuitive experience, then it is fit to be condemned or refuted; on the other hand, let it be any philosophical teaching, if it is indisputable and cannot be invalidated by whatever means and if it is especially in consonance with universal or everyone's experience, then that spiritual teaching or exposition deserves to be respected, revered." Thus the essence of the Vedantic philosophy taught by this world teacher and which will be appreciated and approved by the present-day spiritual seekers in all its aspects will be presented in this small treatise. It is our firm and fond hope that those true seekers, who cannot by themselves understand or comprehend the subtle teachings by directly reading Shri Shankara's original treatises and commentaries or Bhaashyas in Sanskrit, will find this book fully trust-worthy and useful. 2. 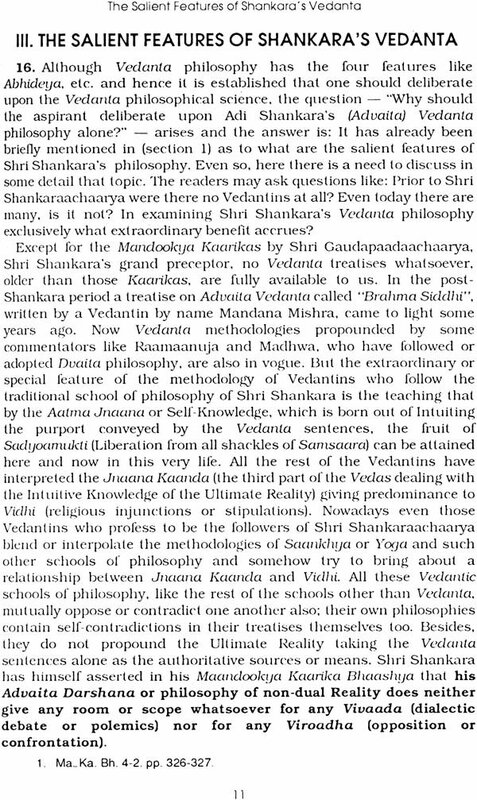 There exist already several Prakaratia Granthas or his own treatises in which the Vedantic methodology of teaching by Shri Shankara is compiled. Among them some have become well-known as works by Shri Shankara himself; some others are compiled by the followers of commentators of Shri Shankara's original works. Because these books are written in Sanskrit language, there is no benefit accruing from them to those who do not know or understand that language. 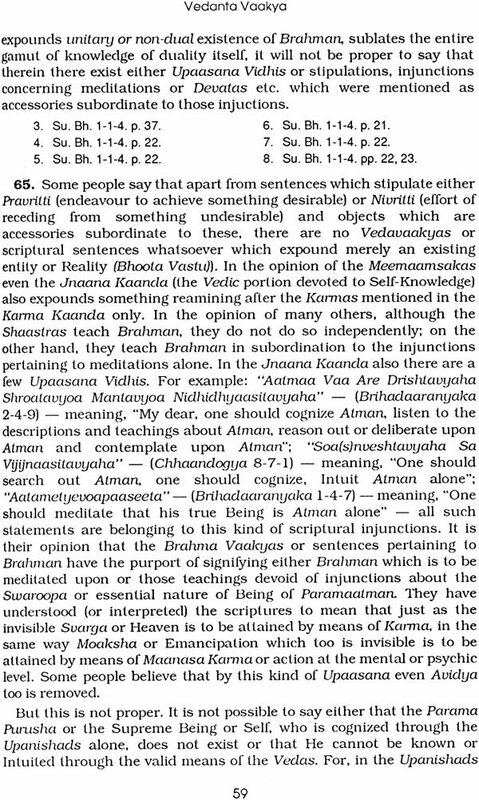 Even to those who know and understand Sanskrit these treatises are not likely to expound or teach beyond doubt Shri Sharikara's pure Vedanta philosophy. For, they contain various methodologies which are mutually contradictory; some of them, writ ten in a style bristling with bizarre and jarring dialectic, are beyond the ken of limited intellects. Many such books written so far in regional languages are translations of those books alone; they too are replete with these defects. Some other books, though they are written independently, are following the Sanskrit treatises virtually as their replicas. In any of these books there do not exist the important teachings culled out from Shri Shankara's Bhaashyas or original commentaries. 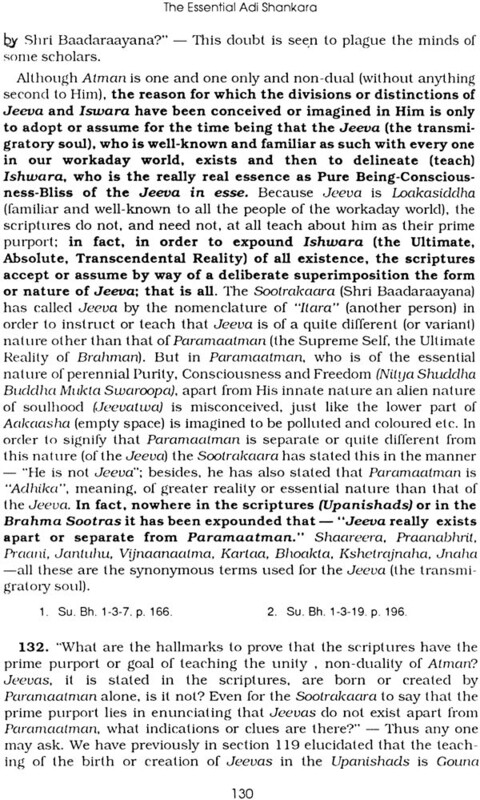 Especially, a singular treatise which elucidates and elaborates completely and comprehensively the principal or fundamental methodology which is the exclusive prerogative and feature of Shri Shankara's pristine pure Vedanta of Non-dualism (Advaita Vedanta) is not yet compiled in any language at all. In order to fill up this lacuna this treatise entitled - 'The Essential Adi Shankara'' - is composed. 3. In this treatise there are some teachings written in an orderly manner pertaining to different topics based on statements collected together from the original commentaries by Shri Shankara on the Prasthaana Traya or the three categories of texts [viz. the Shruti Prasthaana comprising the ten principal Upanishads - Isha, Kena, Katha, Prashna, Mundaka, Maandookya, Aitareya, Taittreeya, Chhaandogya and Brihadaaeanyaka; the Smriti Prasthaana - Bhagavadgeeta; and the Nyaaya Prasthaana - the Vedanta Meemaamsaa Sootras or popularly known as Brahma Sootras). The Upanishads are fundamentally the authoritative sources of the Vedantic philosophy; because they form one part of the Vedas, they are called Shruti. Bhagavadgeeta is a text contained in the epic called Mahabhaarat written by revered Veda Vyaasa in order to explain and elucidate the purport and teachings of the Shrutis; because this Bhagavadgeeta is written by remembering or memorising the teachings and purport of the Shruus, that text is called Smriti; Vedanta Meemoamsaa Sootras (or the Brahma Sootras) is a text of the form of aphorisms written by Shri Baadaraayana in order to determine the spiritual teaching purported to be expounded in the Upanishads along with the concurrence of Bhagavadgeeta by means of and on the strength of Yukti or dialectic; hence, it is called Nyaaya Prasihaana. Because these three categories of texts, viz. Shruti. Smriti and Nyaaya, have ventured out in three different paths or approaches, each one adopting its own exclusive viewpoint or perspective, to depict the spiritual teaching of Vedanta, they are customarily termed "Prasthaana Traua", meaning three paths or approaches. In this book we have predominantly reckoned the commentaries of Shri Shankara on the Prasthana Traya alone as the valid or authoritative means to establish the validity or veracity of any spiritual teaching. The readers may determine or judge that teachings contrary to those found in these Bhaashyas - irrespective of the fact that they may be any texts or treatises by any great post-Shankara author - are not pure Advaita Vedanta of Adi Shankara. 4. In these days it is to be found, to a great extent. that those who teach Vedanta philosophy to the common run of people are doing so by mixing up alien methodologies of different Darshanas or schools of philosophy like Saan1chya, Yoga, Nyaaua. Vaisheshika and Poorva Meemaamsaa etc. It is also a fact that Shri Shankara has at various places in his Bhaashyas written his opinions blending the paths or approaches of the remaining Darshanas in Vedanta. "Poramatam Apratishiddham Anumatam Bhavali" (Sootra Bhaashyas 2-4- 12). He has utilized the Tantra Yuckti or pragmatic axiom of "What we have not refuted as not proper in the teachings of other schools of philosophy, that may be taken as acceptable to us to be true". Therefore, it is not at all wrong or improper if from the point of view of grasping or comprehending the essential purport, other reasonable methodologies are used. 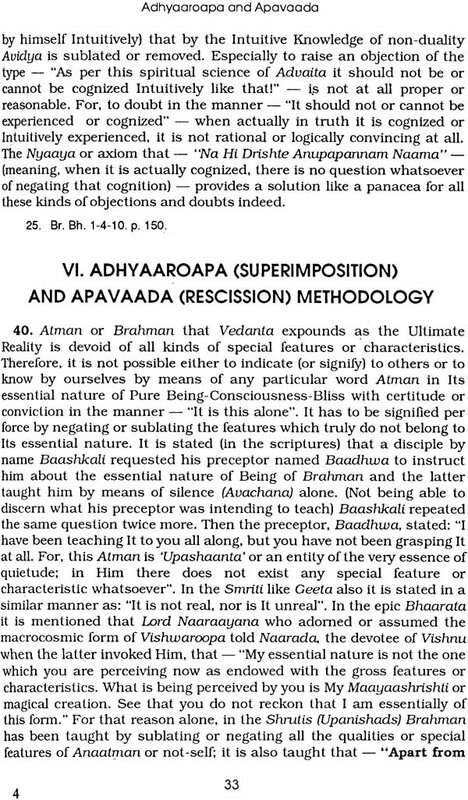 But discarding the Ultimate Reality of Brahman or Atman, which is the prime purport of Vedanta philosophy, either to reckon the other philosophical texts alone to comprise wholly the genuine Vedantic philosophy or to acknowledge methodologies contrary to the Vedantic methodology can never be proper or justifiable. Hence, we will keep on pointing out here and there the dialectic methods of the other schools of philosophy which are refuted or condemned in the Prasthaana Traya Bhaashyas. 4. 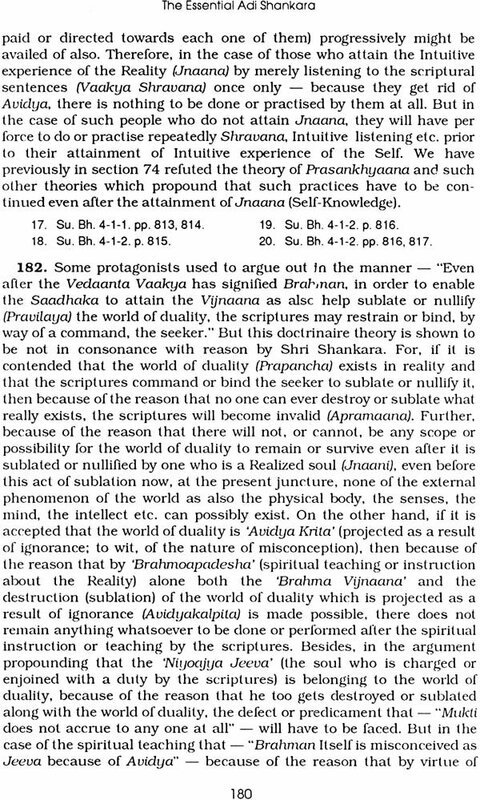 In order to explain the purport of Shri Shankara's Bhaashyas there are Vyaakhyaanas or sub-commentaries. But those Vyaakhyaanas have employed methodologies which are contrary to the original Bhaashyas. Vaartikas, which are written by way of further explaining the Bhaashyas on the Brihadaararujaka and the Taittireeya Upanishads, commentaries called Panchapaadika and Bhaamati, which are available with regard to Vedanta Meemaamsaa Bhaashya (of Shri Shankara) - are predominant among such Vyaakhyaanas or sub-commentaries. Because all these three Vyaakhyaanas are mutually contradictory, we have not taken them for consideration or examination here in this book. Those teachings which are not contrary to the methodology which we have acknowledged (in this treatise) may be accepted or grasped by the true seekers from the viewpoint of understanding or cognizing the essential purport, i.e. the Ultimate Reality of Atman, even from these Vyaakhyaanas and there cannot be any objection whatsoever in doing so. But in this treatise which we have compiled for the sake of those aspirants who wish to know the pristine pure Vedanta philosophy of Adi Shankara alone (totally based on his own original Bhaashyas on the Prasthaana Traya) we have purposefully kept out of consideration these Vyaakhyaanas. 6. Shri Shankara has used some Paaribhaashika Shabdas or technical terms, some Drishtaantas or illustrations as also some Nyaayas or axioms in his works. 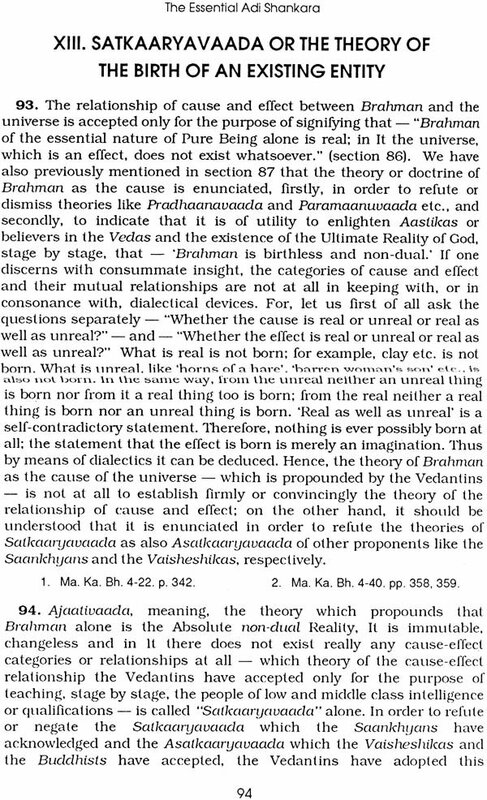 The present-day Vedantins have conceived, in addition to those terms, certain other technical terms; they have used those technical terms and illustrations which Shri Shankara has utilized in a different manner and with a different connotation, and they have, as a result, drawn different conclusions; either they have not taken into the reckoning his axioms as much as they deserved, or even if they have considered his axioms, they have conceived a different meaning or interpretation for them. In order to bring home this lapse on their part to the seekers we have used in this treatise, to a great extent. 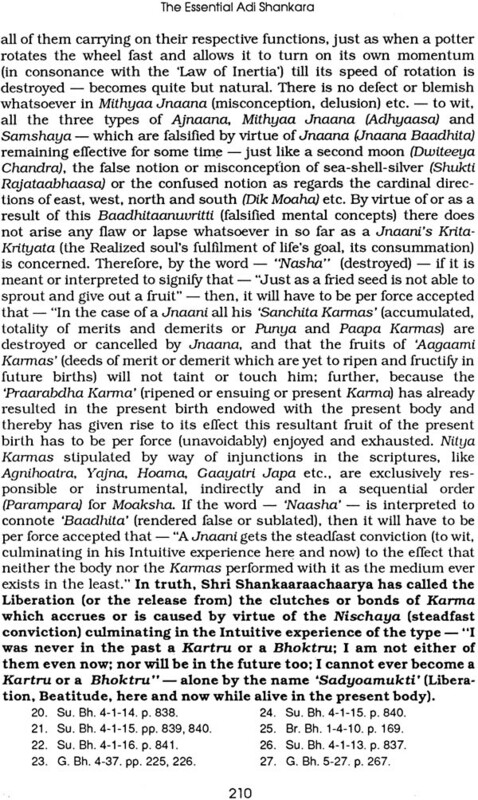 those very technical terms which Shri Shankara has utilized; not only we have mentioned the synonyms of those terms at several places but also wherever we felt it necessary we have briefly mentioned whatever different meanings have been conceived for those particular terms by the present-day Vedantins. Wherever necessary, we have also indicated how and in what aspect the illustrations (used by Shri Shankara in his original Bhaashyas) are correctly used and how they should not be utilized in a particular manner with a particular sense. Indicating briefly the relevant axioms, we have also brought home the necessity of remembering those axioms.